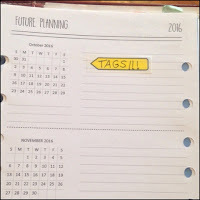 I use tags like the one in the image below to remind myself of recurring tasks. Once the task has past, I move it forward to the next week - simple, yes? So, where do you put your yearly tasks tags? In your future pages! 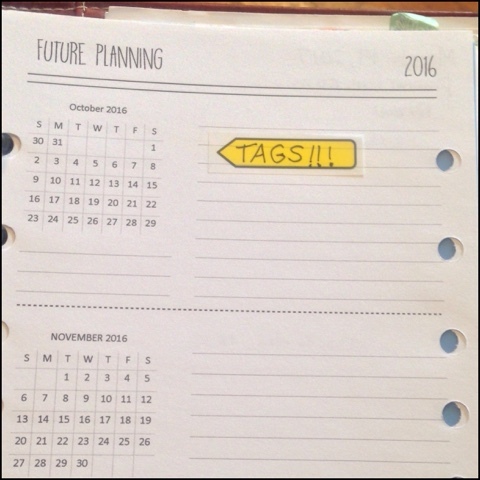 This works fine, but what if I just finished a yearly task in April, where do I put that tag (because I don't have my 2017 future pages yet)? This hack comes to you from Giftie Etcetera: behind your future pages, insert a sheet of paper that says "2017 and Beyond." You can park your tags there (be sure to write the date beside it) until you set up your future pages for the following year. When you check your future pages for the new month, remove any tags waiting and put them on the appropriate daily or weekly page.